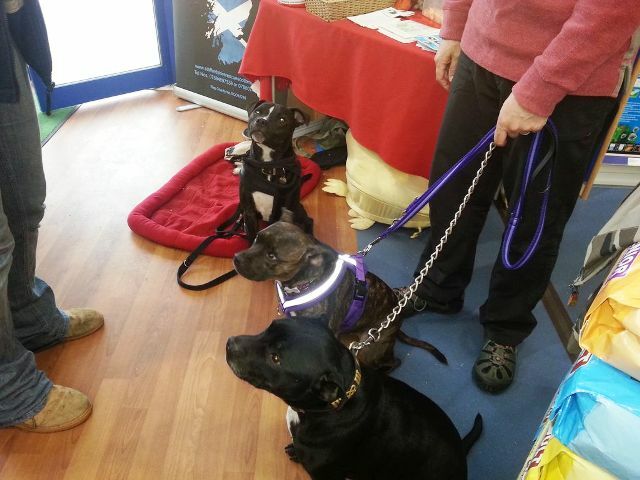 Staffordshire Rescue Scotland awareness day event at Pets at Home – Jack, Cassie and Milo. 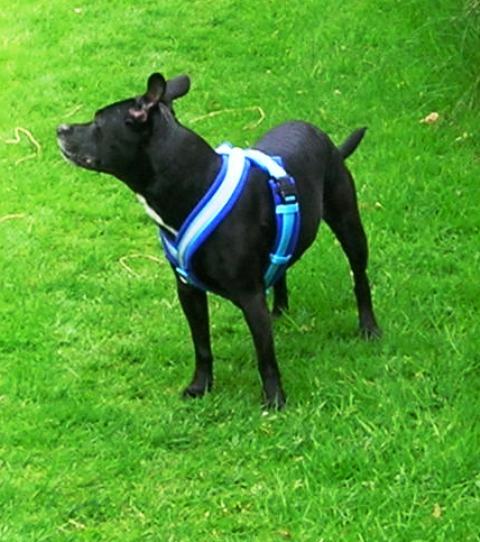 Socks the Staffy in her eDog Fleece Harness. We were introduced to this dedicated save a Staffy charity by one of our customers who had recently taken home Cassie the Staffy (pictured above in her Purple hi vis eDog fleece harness) to her forever home where she is so happy – you may like to check out Cassie and Jack’s blog on Facebook, it’s a really fun read. 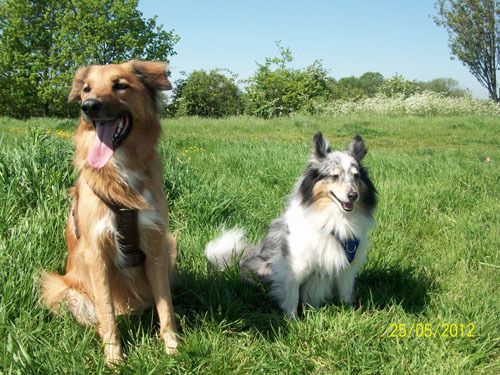 Jack (to left of Cassie in pic) belongs to Lisa (a canine behaviour specialist) who heads up the charity 100% hands on. You can join in a full calendar of fundraising events held all over Scotland – fundays and Staffy awareness days, even Highland Games. Staffordshire Rescue Scotland’s website is very entertaining with plenty of great pics and videos but be warned, you’ll be wanting to be rescued by a Staffy by the time you eventually manage to drag yourself away !! There’s lots of ways you can help the charity practically but if time is not available, you can always donate a little something for these beautiful dogs who desparately need our help. Meet Socks (left) – she belongs to Shiona who won 1st prize in the raffle at a recent Staffy event in Stirling – a custom size eDog fleece harness. Ruff Luck Rescue are a small dog rescue group based in Birmingham/West Midlands – however, Lisa the founder and her team’s efforts are anything but small. They make it possible to give another chance to dogs who have served their statutory 7 days in the council pound- and keep them until they can be found a forever home. Ruff Luck are always needing volunteers, for dog walking, fund-raising and of course fostering. Did you know that if you foster a dog, Ruff Luck offer to pay for both food and any vets fees? Of course many can afford the generosity to pay for these items themselves but don’t let lack of money put you off – Whatever your skills are, if you love dogs, your help would be appreciated – it’s not always about money….but of course, sometimes it is and Ruff Luck get by on only drawing the bare minimum expenses, thereby ensuring donations end up benefitting the dogs entirely for the best. Zak the shepherd dog and Minstrel the shepherd sheltie cross in their eDog fleece harnesses – by kind permission of their Mum, Mary. We support Ruff Luck and recently donated one of our eDog fleece harnesses to one lucky bidder for their online charity auction, in order to raise money for dogs less fortunate than ours. Mary, whose beautiful dogs are pictured above very kindly bid and won one of our fleece harnesses, with the proceeds being donated to Ruff Luck. Thank you Mary and being so generous she promptly ordered one for her other dog which we in turn we discounted. A win/win situation for all dogs and humans concerned! 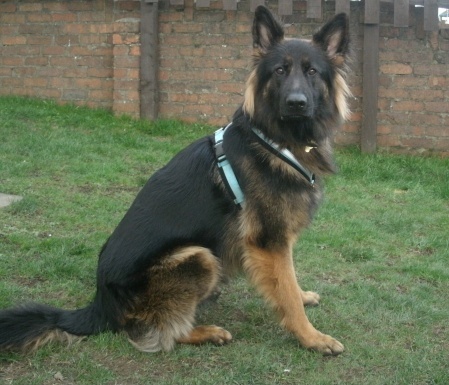 Jasper the german shepherd in his eDog fleece harness. Hope Rescue are based in Caerphilly and are a charity very close to our heart. In 2012 on a windy,pouring with rain August Bank Holiday we attended the S Wales Hope Rescue event which despite the lousy weather was attended by 1200 supporters to watch agility events, doggie fancy dress competition and many other fun events which happen every year at this well-supported event which raises much needed funds for Hope to place many dogs in rescue centres, foster homes and forever homes. The Hope Rescue forum is a great place to hang out for doggie chat and moreover see the dogs who are just waiting for their lucky owner. Above is Jasper – his Mum Eleri bid at the Hope Rescue online Christmas 2012 auction for one of our custom made comfy fleece harnesses which she was lucky enough to win, with the proceeds going to Hope. Hope Rescue always need volunteers and I know we have many customers in Wales – so why not think of offering your services – they are a really friendly bunch and that’s just the dogs! !